FinTech & CyberSecurity Demo Day 2018: Join the experience! On the 8th of February, 11 startups and 1 Scale-up in Residence that have gone through 3 months of intense acceleration at Startupbootcamp FinTech & CyberSecurity will present their solutions at Demo Day in Utrecht. 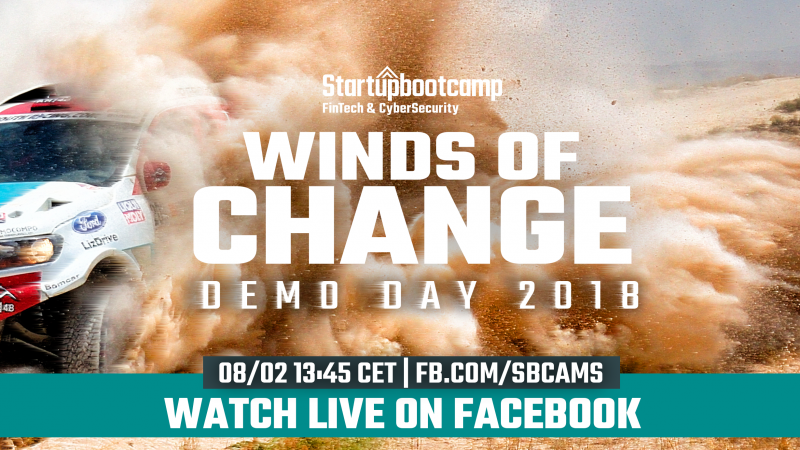 Tune in for the full Demo Day experience – we will be livestreamingg in high quality starting from 13:45 CET! Like our page on Facebook or join the event to get a notification once we go live on the day. Dolphin Blockchain Intelligence (Russia): Provides investors with quick and high-quality risk and profitability assessment of crypto-asset investments. FinCom (Israel): Proprietary technology which enables compliance for KYC onboarding, Anti-Money Laundering & GDPR that works even if names are misspelled or in another language. Gyomo (USA): Prevent phishing by educating clients and staff via crowdsourcing, machine learning, and gamification. Hatch Money (Great Britain): Hatch is a smart bank dedicated to the self-employed. KlippaCast (Netherlands): Makes receipt purchasing data as accessible as online banking. OpSeeker (Spain): Offers an online financial planner to teach retail clients to manage their money more effectively. Penstable (Denmark): Pension products tailored to individual risk and return needs, investing exclusively in impact and sustainability projects, all at a low cost for the client. Stampwallet (Curacao): Make loyalty transactions affordable and easy to implement for B2C & B2B2C. Treasury Delta (Ireland) Treasury Delta helps companies get a better deal on their banking costs. Vision Tech Lab (Portugal): Software used by system administrators to detect, deceive, manage and monitor attacks in company networks using Deception technology and Artificial Intelligence to analyze the attacker’s behavior. Westgate (Great Britain): Software that makes robust encryption, strong authentication and data privacy available to everyone via a secure VPN. Scale-up in Residence FinBase (Netherlands): MijnGeldzaken.nl is the first consumer platform that integrates personal financial management, personal financial planning and personal financial advice. Are you an investor and interested in attending? Feel free to contact us!